The weather over the bank holiday weekend has been great for the garden, bright sunny days with a few overnight showers mixed in. I can really see the difference with the veg I've already planted out. However already I am encountering problems with pests. I had thought this might happen, with the unusually mild winter, even up here, there has been plenty of talk of an onslaught of slugs and aphids this year. I had thought the ducks would be the perfect solution to this, they'll happily hunt around all day eating what they can along the way. The downside to this is radishes and lettuces have also been on their menu at my expense. 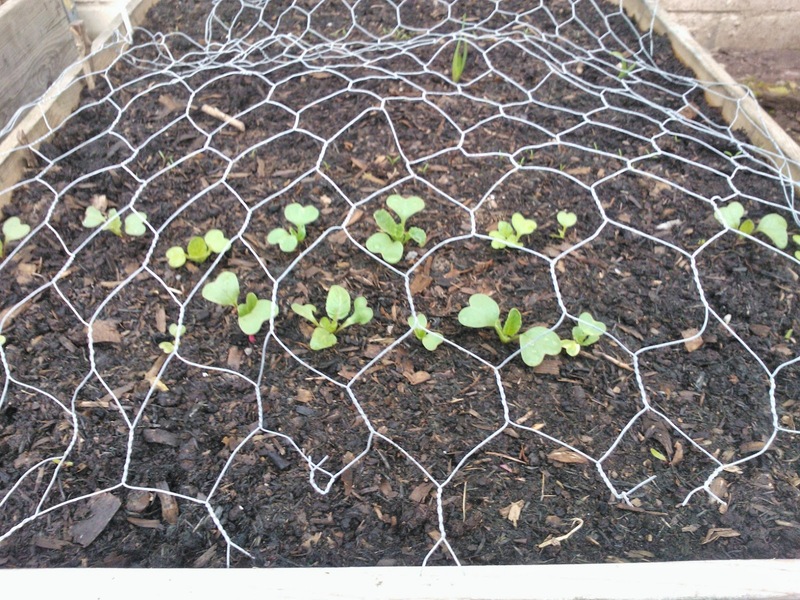 An easy enough solution to this has been to cover over the raised beds with some chicken wire, this will protect the plants until they are big enough to survive losing a leaf or two. 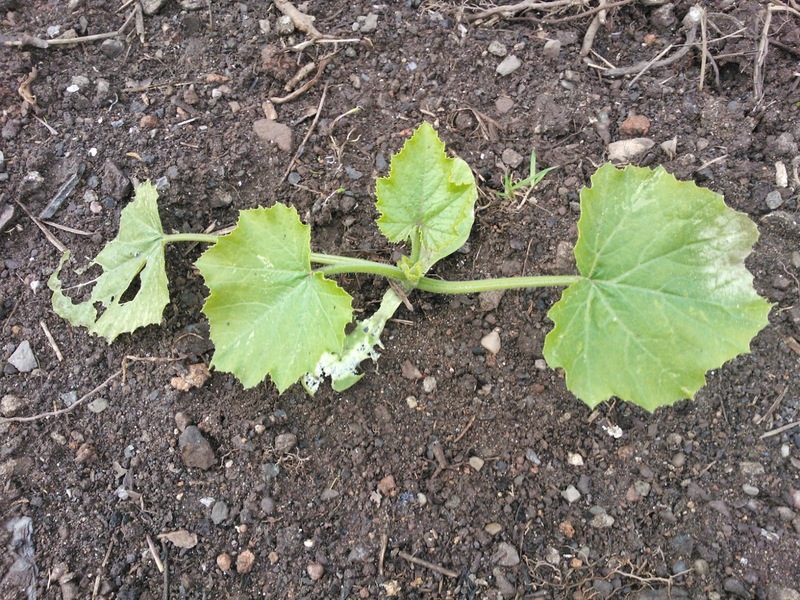 The courgettes I again perhaps over eagerly planted out on Friday have held up surprisingly well. I think I had a bit too much sun on my head Friday afternoon and in the moment decided it was good idea to plant out three courgette plants in mid April. A gamble you might think but two are thriving even following a light frost the same night; The third isn't doing so well and will more than likely have to come out. A mix up in labels when transferring all the plants from the windowsills to the polytunnel makes me think that the struggling plant may be a different variety than the other two. With three different varieties already sown this year it could even be a combination of all of them. I'm no too worried about that though I'll know which they are once they begin to fruit and for future reference this information could prove useful. What I think are slugs have had bit of a nibble at these already, checking with a torch over the next couple of evenings should narrow down the culprits. They should be strong enough now to not be hindered by this, there's a couple of backups in the polytunnel should these fail anyway. If they work then I'm ahead and if they fail I'm still on schedule to plant some more out next month. 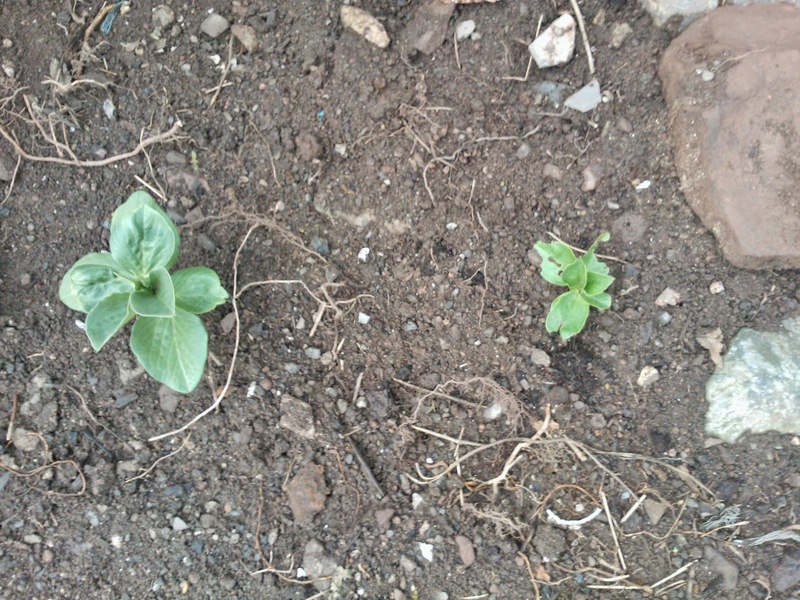 Interestingly their has been a massive difference in my two sowings of broad beans. I planted the first beans direct into the ground around two weeks earlier than others sown inside in cardboard tubes (the first batch sown in February were demolished by wind and hail so I'm already on my second attempt with these). The directly sown beans have had a bit of a rough time and are looking rather sorry for themselves. The indoor sown beans on the other hand have continued to thrive since planting out, looking bigger stronger and well ahead of the earlier direct sowings. This week I have also discovered that a hedgehog has taken up residence in the log shed. Perhaps it has been hibernating there all winter and has now emerged into the spring sunshine. I did contemplate putting out food but it seems perfectly happy snuffling around in the evenings so I'll leave it for now. It's a welcome sight and one I haven't seen for a number of years, the move to the countryside really has reopened my eyes to the fantastic amount and diversity of nature we have in the British Isles. As previously mentioned there are mice occasionally in the garden, these are all candidates for the competition on on my veg patch. I'll be keeping a close eye on all the goings on the narrow down who's eating what and most of all in the end what I get to eat. Speaking from previous experience this will, as all growers know, be an ongoing battle through out the summer. I may deploy some strategically placed beer traps through out the garden should it carry on. The trick is always to sow more than you expect to grow and not to get too disheartened when something fails; There is always something that can go in in place of a poor crop, diversity and successional sowing are going to be key for me this year.